The PayPal Standard Plugin from nopCommerce has 2 address parameters that are passed to PayPal that impact what happens on the PayPal site. The way these parameters are hard coded into the plugin can cause PayPal to reject the login if the customers shipping address is not valid. 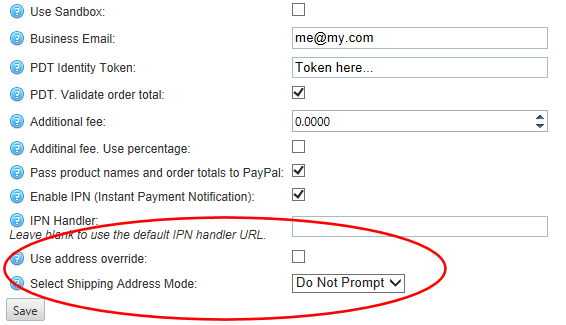 If set on, this overrides the address that PayPal has with the address being passed in from nopCommerce. If there’s an error, the address cannot be modified, and PayPal rejects the login; so the payment will not happen. If set to off, then the address used is the address stored in PayPal. Optional : buyer is prompted to include a shipping address. This would eliminate the need for address validation on PayPal, and since nopCommerce collects and stores the shipping address, you really do not see the need to pass it to PayPal for payment processing.